2018 was a busy first year! We were, at times, overwhelmed with state/church violation reports. Some of these reports we have had experience with and can tell the person who reported what their best course of action would be, or investigate their concerns ourselves while keeping their identity confidential. Other, more egregious reports, we take directly to our legal council to get a clearer legal review of the violations. We also had a great year of community service and activism! NIA continues our A.C.E.S. 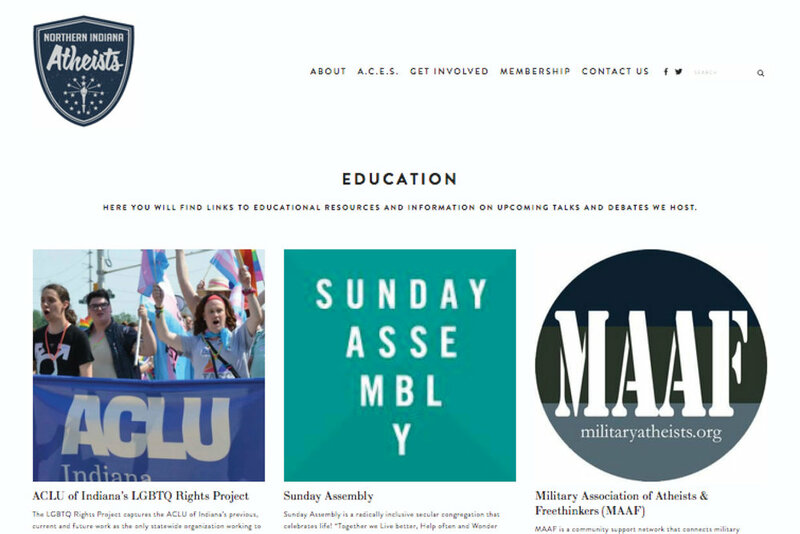 Program, Activism, Community Service, Educaiton, and Social events. Read more about each of these below. Our “Oh Come All Ye Faithless” Holiday Display was extremely well received. The positive feedback from the community far outweighed the negative. We received a lot of great media coverage and exposure for NIA. We’ll be back next year and similar displays might even pop up in other places. 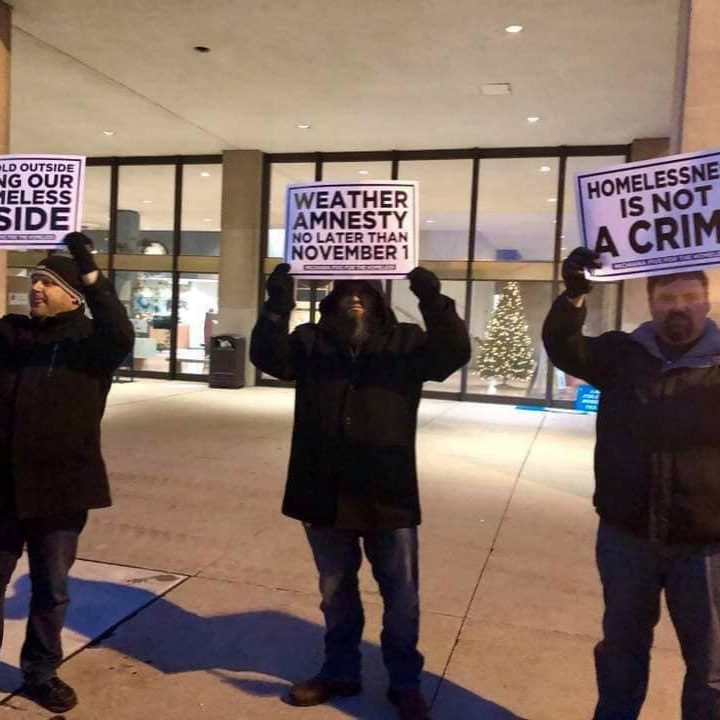 NIA members and allies have spent a lot of time demanding action from our government and raising awareness in the community about the homeless issue in our community. For the last three years, Courtside Ministries has set up a "Need Prayer?" table on the Elkhart County Courthouse lawn every Friday morning to interact with (sometimes even pestering) the foot traffic going in and out of the courthouse. Hey, we have a table! So we contacted the county commissioners and requested equal access to that public space. After shutting down their excuses why we couldn't have equal access, and catching them in a few lies, they have no choice but to allow us equal access or allow no one equal access. We’ve set up a table a few times with positive feedback from the community. And the conversations with Courtside Ministries are always entertaining. NIA continues working with Michiana Five for the Homeless to supply new and gently used winter clothing to the homeless in our community. You can bring a donation to any of our events for donation. This is an ongoing clothing drive as the need in the community is constant. We made a large donation of winter clothes to the Shepherd’s Cove Clothing Pantry. These clothes are given free or at a small cost to community members who need them. You can bring a donation to any of our events for donation. This is an ongoing clothing drive as the need in the community is constant. Our Adopt-A-Family fundraiser was AMAZING! The final amount donated was almost 10 times what we expected to receive. We were able to help six families with gifts for the holidays. Not only that, but some of our members stepped up and donated food vouchers to help those with food insecurities over the holidays. We have a lot of atheist and secular resource links on our website: https://northernindianaatheists.com/education/ - If there are other educational resources you would like to see us promote, please let us know. Join our Meetup Group and watch for future events!